Poha / Flattened rice / Rice flakes are soaked in water to turn them soft. Onion and potato are fried in oil along with whole spices and fresh fenugreek leaves. Once the vegetables are cooked, poha is added. 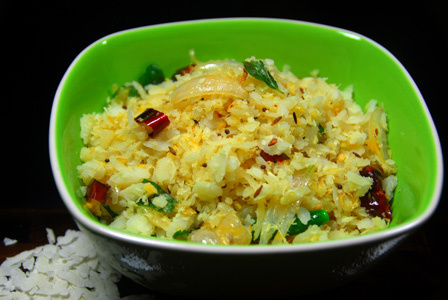 The poha methi upma is finished with lemon juice. Serve poha methi upma immediately. 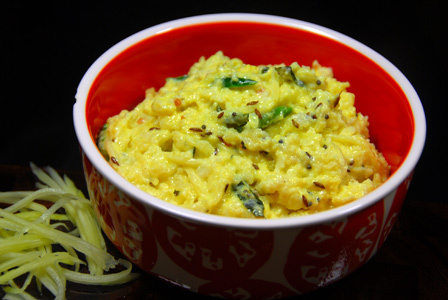 Makes: around 2 Servings of Poha Methi Upma. Peel, wash and chop the potato into small pieces. Peel and finely the onion and garlic cloves. Thoroughly wash the fenugreek leaves. Wash the poha under warm water. Fry briefly, add chopped potato and onion. Fry till onion turns golden brown in color and potato is soft and start to brown around the ends. Add fenugreek leaves and salt and cook till fenugreek leaves wilt. Fry briefly, stir in soaked poha, turmeric powder and salt (if necessary). Stir carefully to mix everything and remove from heat and stir in lemon juice. Serve poha methi upma immediately. Suggestions: If poha is not soaked well, sprinkle water on the poha to make it soft. If poha is over soaked, spread and let it dry for few minutes. Fry methi leaves for longer time to reduce the bitterness. Variations: Check other recipes with poha here. Other Names: Poha Methi Upma, Atukulu Menthi Kura Upma. Poha / Flattened rice / Rice flakes are soaked in water to turn them soft. 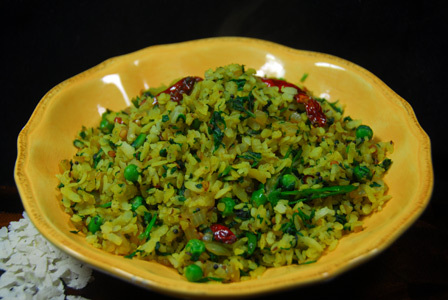 Finely chopped spinach, onion and peas are fried in oil along with whole spices and poha is added as a finishing step. 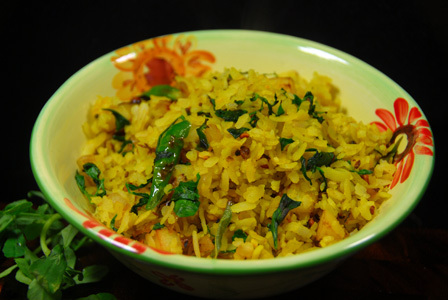 Lemon juice adds the freshness to the poha. Serve spinach poha upma immediately. Makes: around 2 Servings of Spinach Poha Upma. Wash and finely chop the spinach leaves discarding any hard stems. Strain the poha and season with salt and stir in lemon juice. 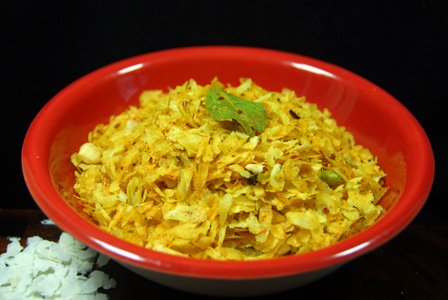 Keep aside for around 5 – 10 minutes for poha to absorb the salts and puff up a little. Fry till onion turns golden brown in color, add chopped spinach, green peas and salt. Fry till spinach completely wilts and start to brown. Stir in soaked poha, turmeric powder and salt (only if required). Remove from heat and stir carefully to avoid breaking the poha into pieces. Serve spinach poha upma immediately. Suggestions: If poha is not soaked well, sprinkle water on the poha to make it soft. If poha is over soaked, spread it over a plate in single layer and let it dry for few minutes. Add more spinach to the onion if desired. Other Names: Spinach Poha Upma, Palakura Atukulu Upma.